I'm all for grooming of the hands and keeping them tidy and moisturised. I buff, smooth, massage in nail oil and use handcream like it's going out of fashion (I have dry hands), and try to keep my cuticles clean, especially since I am almost always wearing nail polish. After all, I have so many, it's only appropriate I wear them, right? It never crossed my mind though that maybe what my hands could do with would be a little bit of exfoliation to help keep the hands soft. 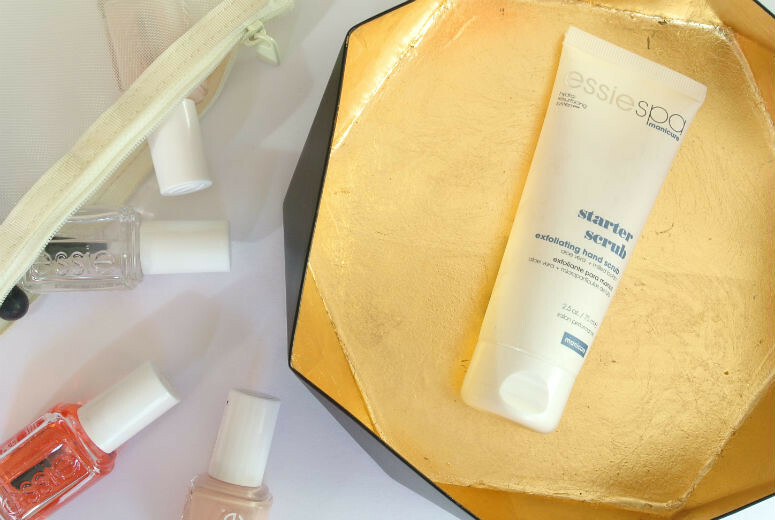 It was on a trip to my local Boots looking for my next nail colour fix that I even noticed a slightly plain white tube at the Essie stand that said after use it would leave my hands 'feeling softer and smoother instantly'. That definitely had me intrigued! The scrub contains aloe vera for softening and moisturising the skin, and milled loofah as the actual 'scrubber'. To use, you just need to wet your hands, squeeze out a bit onto them, rub in a circular motion, and then rinse off. It feels a bit odd at first, knowing that you're rubbing loofah over your hands, but it seriously works. My hands felt the difference instantly! If you have dry hands like myself, you might worry that this will dry them out more, but you can put that fear away. I didn't find this in the least bit drying, but I would advise using a hand cream afterwards. It has the mildest and faintest of fragrance that goes away quickly so there's very little risk of irritation from this. I am really pleased I have brought this into my handcare routine, I have a feeling that if I follow this up with the new shea butter and goat milk soap one of my friend's gifted me, it will make a big difference to my dry hands. I bought mine from Boots along with a couple of other items from the Essie stand, which meant I also got a free minis kit, so if you're interested, get yourself to your nearest stand now!